Make sure you buy the right type of box. Dry flies, with their stiff hackles, wings, and tails, must be stored loosely in a sealed compartment or held upright on a clip. They can't be folded together, or the fly materials will mat together or bend and not float properly. Wet flies and most streamers and nymphs, however, can be stored tightly. For these types of flies, some anglers use fly wallets, which are zippered leather or cloth cases with sheep-skin interiors; or fly books, which are similar to wallets but have foam pages onto which flies are attached. Fly boxes vary in design, with some having foam or sheepskin interiors and others having small plastic compartments. The basic rule of fly storage is to keep dries, wets, streamers, and nymphs in separate boxes, and organize them into different sections or compartments according to pattern and size, labeling the sections as such when your collection gets large. Otherwise, the choice of fly-box style and design is a personal one. Tackle boxes are like plastic toolboxes with many small compartments to hold lures, hooks, and other tackle. Modern tackle boxes are made of cloth and hold a number of individual boxes, each with separate compartments. Tackle boxes are the best choice for stationarythat is, boat or bankfishermen. 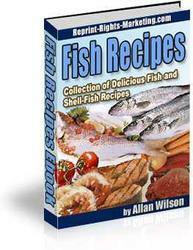 Fishing vests have numerous pockets sized to hold small boxes of tackle and other fishing gear. 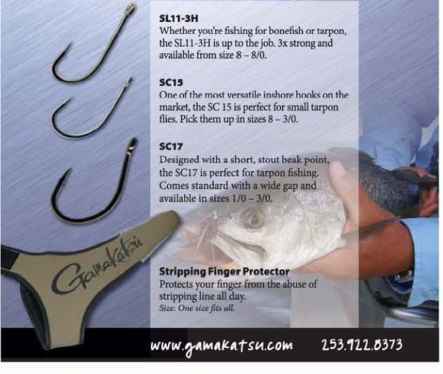 They're best for anglers who wade streams and lake shallows. Creels, both wicker and canvas, are designed to hold both fish and tackle. 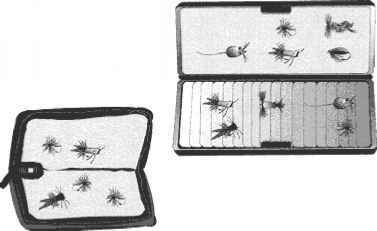 Fly boxes hold numerous flies in a practical manner, with some designed to carry dry flies without bending the hackles, wings, and tails.